Get Insane results by challenging yourself to get in shape. Intense but so worth it! Just finished week 1 of the Insanity workouts by Beachbody. It is definitely a very challenging workout routine. It was a struggle at times but I feel that the results will definitely be worth it. 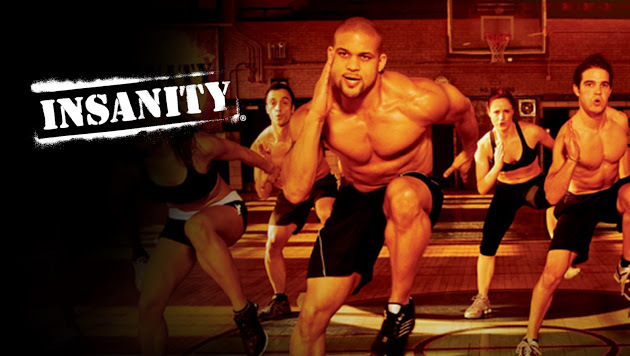 Since I am out of shape, I figured it would be hard for me to really complete the Insanity workouts and I was initially afraid that I wouldn’t get a good workout. I was completely wrong. Although the workouts are intense and Shaun T pushes you to your limits, there are plenty of reminders to go at your own pace. Shaun T also instructs the people in the video to take breaks at certain points or when he sees that their form started being compromised. I thought this was a very good thing for them to add with such an intense workout. I really think this helps to not feel bad about needing a break or not being able to do the exercises as easily as the people you see in the Insanity video. Unfortunately some workout videos ignore the fact that “normal” people will be doing these workouts and need to know they aren’t alone in their struggles. I found myself taking breaks often and making sure I had enough water. As the week continued on though I noticed that I was taking fewer breaks and feeling better throughout the workouts. I’m still struggling but that little bit of progress is so promising. As you can see from the routine list, it was a pretty light week. There was a rest day and the fit test was just a gauge of where you are at before you started Insanity. I didn’t do the fit test because I already had an idea of where I was and where I wanted to be. So I took my measurements as a starting point. My favorite routine from this week was the Plyometric Cardio Circuit. Some of the drills reminded me of my “glory days” back in high school. Some of the moves were from sports like football and basketball. I remember doing these drills, but unfortunately I was in a lot better shape back then. It will be great to be able to do these drills without feeling tired and without my muscles burning. I’m not there yet, but I’ll get there! So after one week of Insanity, there isn’t much measurable results. I’m only down 1lb to 168.2, but it’s better than nothing. I was a little disappointed because of how insanely hard the workouts were. I thought I would just be dropping the pounds like crazy. I should have known better because it takes time for your body to adjust. I do feel stronger and definitely feel like I’m in better cardio shape. I’m looking forward to week two and seeing what progress I can make. If you are thinking of starting Insanity and would like someone to motivate you or just have someone to talk to about the workout routines feel free to hit me up! Unfortunately with how much I had to work, I didn’t have the time to dedicate to insanity. I switched back to P90X3 and want to finish that out before I take on Insanity again. By that time my work will have died down and I’ll have more free time.